Impact of prenatal stress and environmental enrichment prior to weaning on activity and social behaviour of piglets (Sus scrofa). By Sophie Brajon, Nadine Ringgenberg, Stephanie Torrey, Renée Bergeron, Nicolas Devillers, 2017. Applied Animal Behaviour Science 197: 15-23. • Prenatal stress (PNS) can have detrimental effects on piglets behaviour and welfare. • Pre-weaning enrichment may compensate negative effects of PNS in piglets. 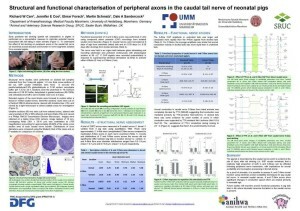 • PNS effects were delayed after weaning at d 27 as shown by an increased inactivity. • Enrichment had positive effects but its removal at weaning affected behaviour. • Pre-weaning enrichment did not compensate for the effects of PNS. Prenatal stress (PNS) can have detrimental effects on behaviour and welfare, such as decreased exploration. Whether housing enrichment before weaning compensate negative effect of PNS in commercial pigs is unknown. To address this question, 44 sows were assigned to either a mixing stress (T) or a control (C) treatment in mid-gestation. During lactation, half of the T and C sows were housed with their 12-piglets litter in straw enriched pens (E) while the others were housed in standard farrowing crates (S). At weaning, 6 piglets per litter were selected and moved to non-enriched standard pens. Lying down, exploration and social behaviour were recorded in the home-pen before weaning (d 6, d 12, d 20), on the day of weaning (d 21), and after weaning (d 22, d 27) using scan and one-zero samplings. Three piglets per litter were individually subjected to a social isolation test and a social confrontation test at d 17. Data were analysed by day using mixed models with PNS, housing enrichment and their interaction as fixed effects. We found no interaction between the treatments, suggesting the absence of a compensatory effect of enrichment on PNS. Pre-weaning enrichment promoted exploration (P< 0.004) and seemed to improve comfort, as piglets spent more time lying down (P< 0.02), but was associated with reduced locomotion and play fighting (P< 0.03) compared to no enrichment. After weaning, E piglets explored less (P< 0.01) and played less (locomotion and fighting play: P< 0.0003) than S piglets. They also performed more belly-nosing at d 27 (P =0.04). These results support the idea that the removal of enrichment at weaning negatively affects piglets. The E piglets exhibited higher emotional reactivity than S piglets (i.e. more high-pitched calls and escape attempts) during the social isolation test, but no clear effect was observed during the confrontation test. The effects of prenatal stress on behaviour were only apparent after weaning. On d 27, T piglets spent more time lying (P =0.02), and showed reduced exploration (P =0.004), locomotion play (P=0.03), fighting play (P=0.04) and mounting behaviour (P =0.002) than C piglets. In conclusion, both prenatal stress and pre-weaning enrichment affected piglet behaviour, but a compensatory effect of enrichment on the negative effects of prenatal stress could not be demonstrated. Concerns exist over the long term consequences of tail docking on possible tail stump pain sensitivity due to the development of traumatic neuromas in injured peripheral nerves. Traumatic neuroma formation may cause detrimental sensory changes in the tail due to altered peripheral and spinal neuronal excitability leading to abnormal sensation or pain. 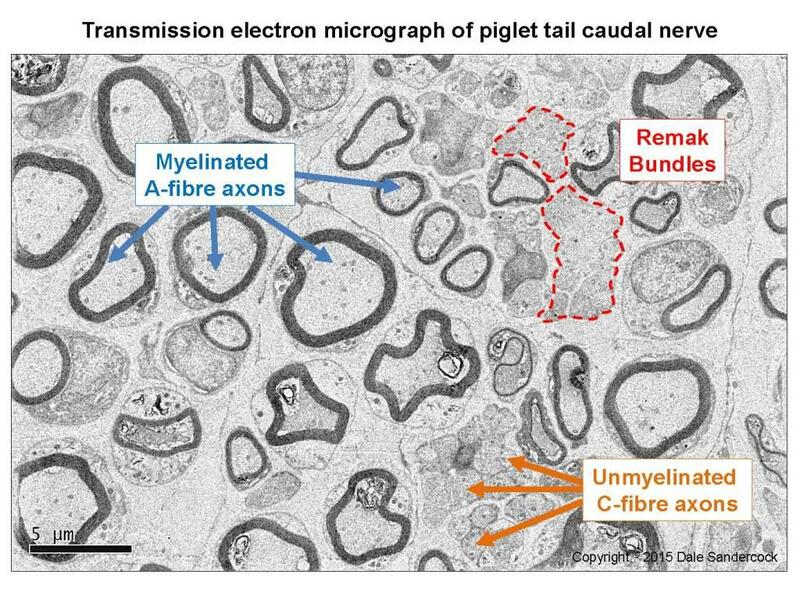 We have investigated tail injury and traumatic neuroma development by histopathological assessment after tail docking and measured the expression of key neuropeptides associated with peripheral nerve regeneration, inflammation and chronic pain. 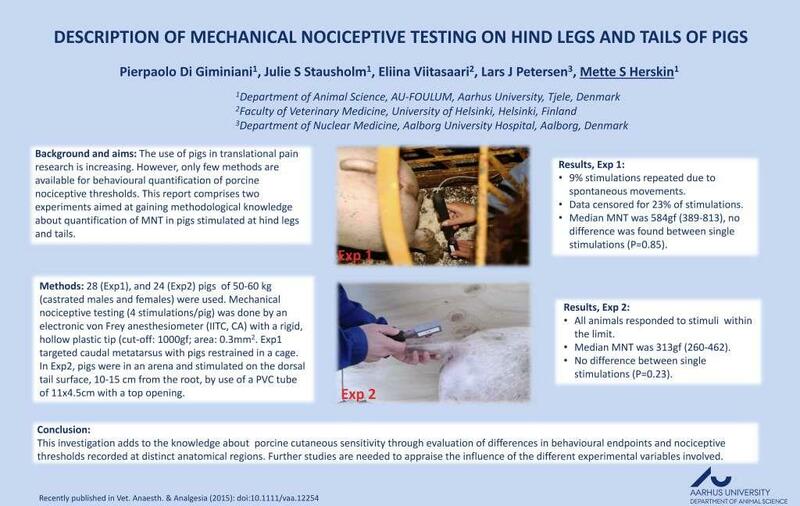 In complimentary studies on tail docking and tail biting, we have developed behavioural assessment approaches to measure mechanical nociceptive thresholds (MNT) in the pig tail in purpose built test set-up using a Pressure Application Measurement (PAM) device. Using these approaches we have determined baseline MNT in intact tails along different regions of the tail and also measured changes in MNT over time in pig with resected tails (simulation of the effect of tail biting). 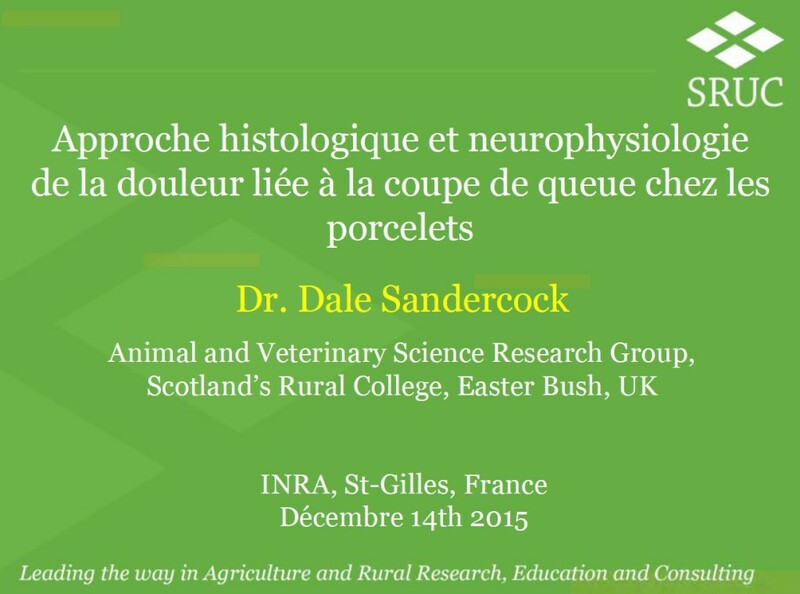 An overview of other Scotland’s Rural College (SRUC) pig health and welfare research projects is also presented. 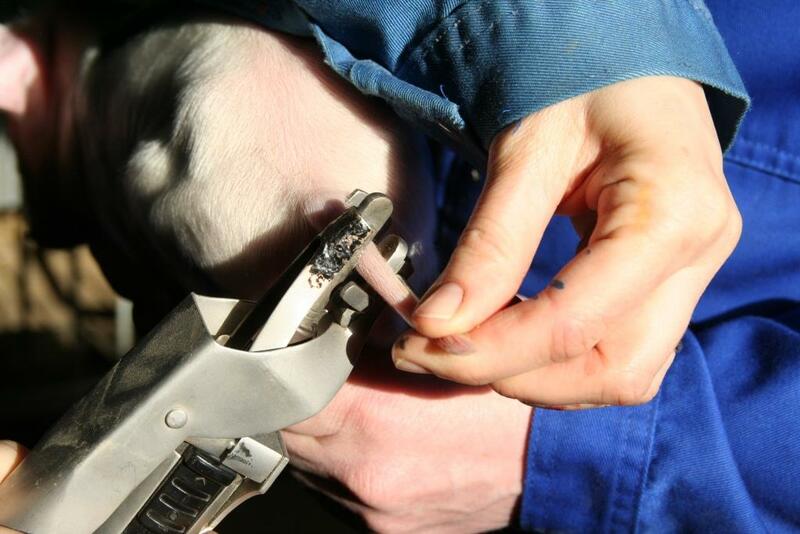 Damaging biting behaviours such as tail biting expressed by pigs is a huge problem in husbandry systems as it reflects and causes severe health and welfare problems, and economic losses. Many organisations world-wide focus on preventing and reducing these unwanted behaviours and so does Wageningen University and Research Centre, the Netherlands. During the Paris meeting of the Farewelldock-team (April 8 2015), a number of past, present and (possibly) future projects in which the Adaptation Physiology Group of Wageningen University is involved, were presented that incorporate the problem of tail biting in pigs. In this blog two of the projects will be introduced: 1. 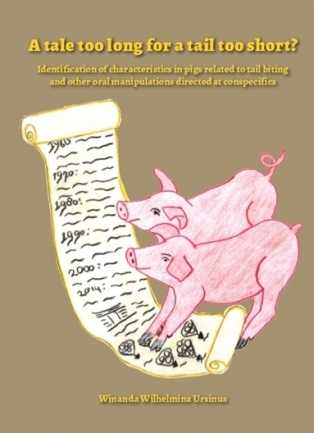 A PhD trajectory entitled ‘A tale too long for a tail too short: Identification of characteristics in pigs related to tail biting and other oral manipulations directed at conspecifics’; 2. A project based on the Dalfsen Declaration: ‘Curly tails, the Dutch approach’. In 2010 Nanda Ursinus started her PhD trajectory and had as main aim to identify biological characteristics of barren and enriched housed pigs that relate to their tendency to develop these damaging oral manipulative behaviours. The project was supervised by Professor Bas Kemp and Dr Liesbeth Bolhuis of the Adaptation Physiology Group, and Dr Kees van Reenen of Wageningen UR Livestock Research. 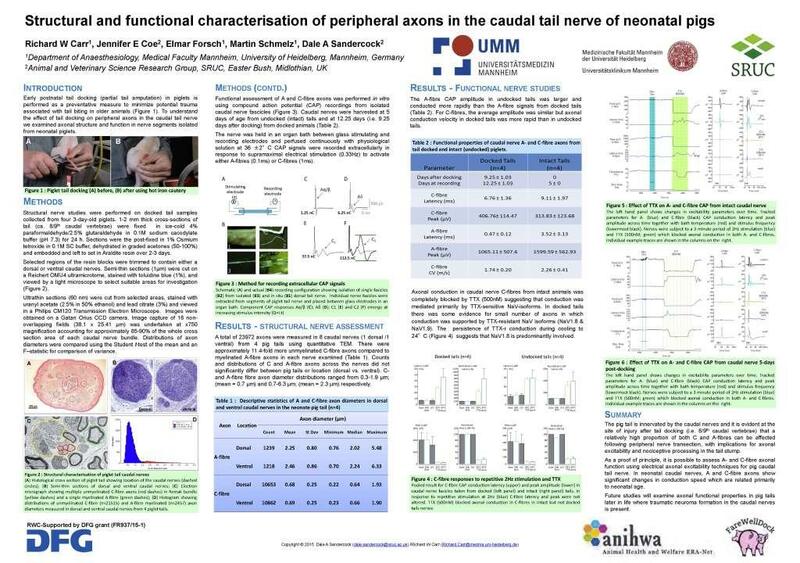 In October 2014 the project finished by defending the thesis in front of an international committee. 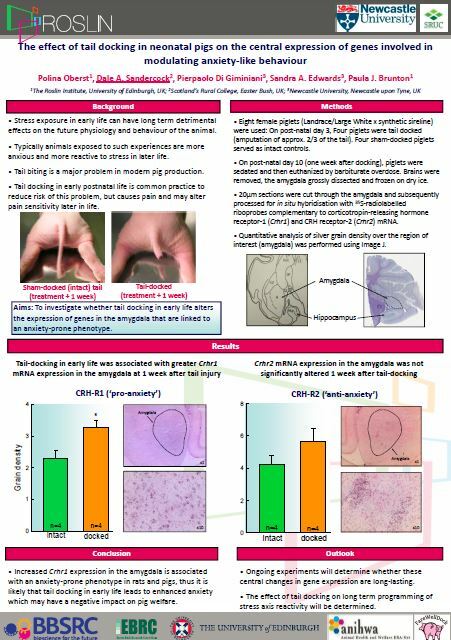 The project showed that tail biting behaviour in intensively kept piglets with undocked tails can start as early as the lactation period leading to small tail wounds (± 10% of 480 piglets) observed at time of weaning (i.e. 4 weeks of age). Tail damage was largely prevented by providing straw-bedding, but tail wounds were not fully eliminated (1 pig out of 240 pigs was removed due to a tail wound) (Ursinus et al. 2014 Appl Anim Behav Sci 156:22-36). As straw-bedding is not suitable in many intensive pig husbandry systems, the use of jute sacks as enrichment device was explored. In partly docked gilts, jute sacks were able to reduce the presence of tail wounds five-fold and reduced the occurrence of damaging biting behaviours up to 50%. Furthermore, jute sacks tended to reduce damage to the sows’ tail inflicted by piglets (Ursinus et al. 2014 J Anim Sci 92:5193-5202). Post-weaning, tail biting pens could be predicted by an increased activity and increased levels of pig and pen-directed (e.g. jute sack usage) oral manipulative behaviours (Ursinus et al. 2014 Appl Anim Behav Sci 156:22-36; Camerlink et al. 2015 Behav Genet 45:117-126). Displaying tail biting behaviour by individual pigs is often temporary and consequently inconsistent over time; once a tail biter is not always a tail biter (Ursinus et al. 2014 Appl Anim Behav Sci 156:22-36). There seems to be one exception to this rule: gilts that were identified as high-tail biters during the rearing phase, were identified as high-tail biters during the nursery phase as well (Ursinus et al. 2014 J Anim Sci 92:5193-5202). This suggests that obsessive tail biters (as previously described by Taylor et al. 2010 VET J 186:137–147) may be more consistent in displaying tail biting behaviour than other types of tail biting behaviour. 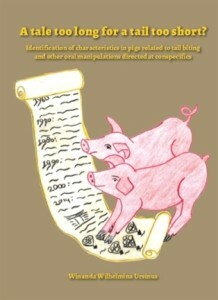 The main hazard in this is that obsessive tail biters are only occasionally present on farms and consequently but not surprisingly, it was hard to identify individual behavioural predictors of tail biting pigs. However, tail biters were likely to stem from a litter with a relatively high level of tail biting behaviour (Ursinus et al. 2014 Appl Anim Behav Sci 156:22-36). Additionally, in a spin-off project with piglets (n=160) that received a jute sack for three days (starting at 15 days of age), individual jute sack manipulation (i.e. nosing, chewing and rooting) turned out to be promising in terms of predicting biting behaviours (mainly directed at other body parts than the tail or ears) at 12 weeks of age (in preparation). We also studied pig personality a bit closer; although there are indications that tail biters would be active copers during stressful situations, our study did not find consistent evidence for that. However, our results suggested a higher level of fearfulness expressed during a novel object test in tail biting pigs. This finding was accompanied with lower blood platelet serotonin levels (i.e. a neurotransmitter involved in for instance mood) in tail biting pigs (Ursinus et al. 2014 PloS One 9:e107040). In a previous study, we also found signs that blood platelet serotonin and serotonin activity in the right hippocampus were related to a pig’s fearfulness (Ursinus et al. 2013 Physiol Behav 118:88–96). Our findings perfectly matches literature about mental disorders in humans and behavioural abnormalities in other animal species (e.g. feather pecking in laying hens). Tryptophan (i.e. the precursor of serotonin) is involved in many biological processes, also in for instance the most important production parameter in pigs: growth. Both phenotypic and genetic production parameters pointed in the direction of an association with (tail) biting behaviours in gilts (Ursinus et al. J Anim Sci 92:5193-5202) implying that pigs are searching for something with a nutritional value, possibly tryptophan. Although tail biting behaviour is not as consistently displayed in individual animals as previously expected and the environment seems to play a large (or even the largest) role in the development of damaging biting behaviours, the results show that also the role of genetics cannot be ignored. Up until now it is difficult to capture the level of expressed tail biting in direct breeding values. However, indirect breeding values or ‘indirect genetic effects’ have been associated with tail damage. 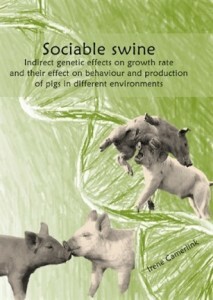 Pigs differ in their heritable effect on their group mates’ growth and pigs with a positive effect on their group mates’ growth were found to cause less tail damage (Camerlink et al. 2015 Behav Genet 45:117-126). Tail biting behaviour in pigs thus seems to be caused by a variety of temporary states and more stable traits that influence their motivation to display foraging and exploratory behaviours. Preventing and reducing such unwanted behaviours requires a joint effort of science, industry and society to optimize housing conditions, feeding, management and breeding of pigs. 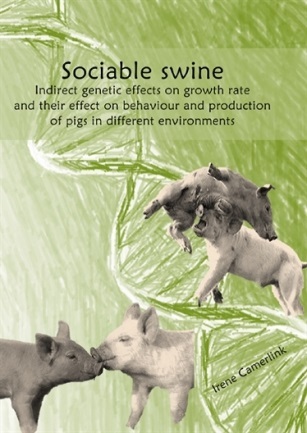 Sociable swine: Indirect genetic effects on growth rate and their effects on behaviour and production of pigs in different environments. Irene Camerlink, 2014. (Em)pathetic pigs? 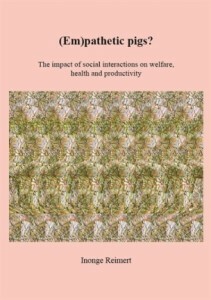 The impact of social interactions on welfare, health and productivity. Inonge Reimert, 2014. 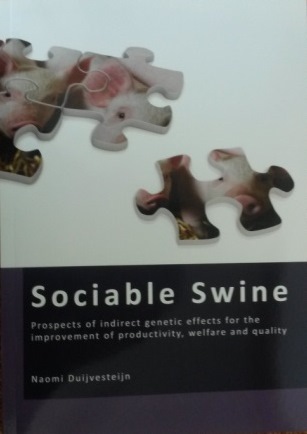 Sociable Swine: Prospects of indirect genetic effects for the improvement of productivity, welfare and quality. Naomi Duijvestein, 2014. Engaging Society in Pig Research: A multi-stakeholder approach to enhance animal welfare in pig production. Marianne Benard, 2014. 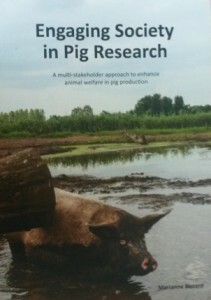 In 2012, a group of Dutch stakeholders in the pig farming sector joined forces in an attempt to find ways to reduce the need for tail docking in pigs kept in the Netherlands. Therefore they developed and signed a Declaration, now called the ‘Dalfsen Declaration’. Declaration partners involve the industry (Dutch Federation for Agriculture and Horticulture (LTO), Dutch union of Pig Producers (NVV), Coppens Animal Feed, Topigs (now Topigs Norsvin), Royal Netherlands Veterinary Organisation (KNMvD) and Vion Food Group), an NGO (Dutch Society for the Protection of Animals), and a research centre (Wageningen University and Research Centre: Department of Animal Sciences and Wageningen UR Livestock Research). The ambition of this stakeholder-group was supported by the Dutch Ministry of Economic Affairs and several other parties in the pig chain. During the course of time 3 routes are followed: 1. A demonstration project, 2. Creating a network of Dutch front runners, and 3. Stepwise increasing the tail length. 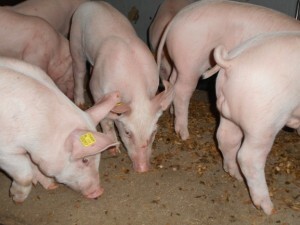 The demonstration project started end 2013 at Pig Innovation Centre Sterksel (VIC Sterksel), the Netherlands, and likely ends in December 2015. The project allows animal caretakers to practice with a number of enrichment materials and to learn understanding the behaviour and especially the tail posture of pigs. Enrichment materials used were sometimes rather complex (such as straw or grass silage) and at other times less complex (such as a rope or straw pellets). The materials were provided on the floor, at the walls, or hung from the ceiling and eventually need to be valued by the caretakers as easily applicable in Dutch (intensive) husbandry systems. Enrichment is used both as a preventive and curative measure. As many pig farmers are in search of especially curative measures it is highly important to assess if enrichment materials are suitable in ending or at least reducing the severity of ongoing tail biting outbreaks. In 2015, a start-up meeting was organised with a group of enthusiastic front runners that keep pigs with long tails or are willing to try increasing the length of the tails of (some of) their pigs. During this meeting farmers gave insight in what they need (on their own farm) in order to be able to keep pigs with longer tails. These farmers will be guided and their actions will be monitored. The main ambition is to stepwise increase the length of pig tails in the Netherlands by gradually docking less. Collaboration with neighbouring countries is desired and therefore first steps are made by the Dutch Ministry of Economic Affairs to assess if (the Ministries of) Germany and Denmark share the vision of the Dalfsen Declaration Partners and are willing to join forces as well. Contact person of the Dutch Curly tails project is Geert van der Peet (geert . vanderpeet @ wur . nl). Herskin et al. (2015) studied the formation of neuroma’s in pigs after tail docking. In pig production, piglets are tail docked at birth in order to prevent tail biting later in life. In order to examine the effects of tail docking and docking length on the formation of neuromas, we used 65 pigs and the following four treatments: intact tails (n=18); leaving 75% (n=17); leaving 50% (n=19); or leaving 25% (n=11) of the tail length on the pigs. The piglets were docked between day 2 and 4 after birth using a gas-heated apparatus, and were kept under conventional conditions until slaughter at 22 weeks of age, where tails were removed and examined macroscopically and histologically. The tail lengths and diameters differed at slaughter (lengths: 30.6±0.6; 24.9±0.4; 19.8±0.6; 8.7±0.6 cm; P<0.001; tail diameter: 0.5±0.03; 0.8±0.02; 1.0±0.03; 1.4±0.04 cm; P<0.001, respectively). Docking resulted in a higher proportion of tails with neuromas (64 v. 0%; P<0.001), number of neuromas per tail (1.0±0.2 v. 0; P<0.001) and size of neuromas (1023±592 v. 0 μm; P<0.001). 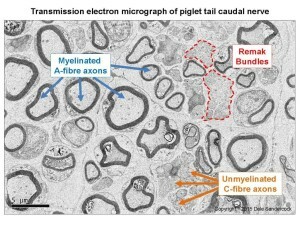 The results show that tail docking piglets using hot-iron cautery causes formation of neuromas in the outermost part of the tail tip. The presence of neuromas might lead to altered nociceptive thresholds, which need to be confirmed in future studies. Herskin, M.S., Thodberg, K., Jensen, H.E. 2015. Effects of tail docking and docking length on neuroanatomical changes in healed tail tips of pigs. Animal 9: 677-681.